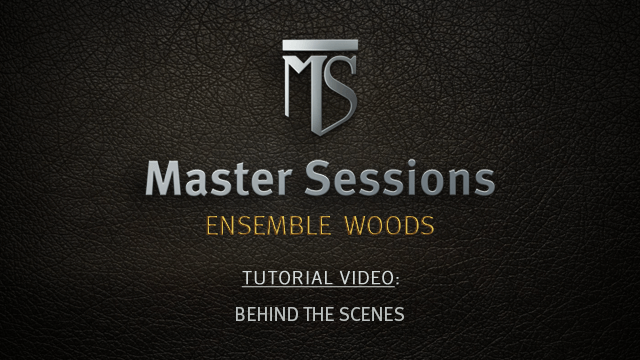 What is Master Sessions: Ensemble Woods? Master Sessions is Heavyocity’s boutique line of scoring tools for the pro composer. Recorded in New York City, the Master Sessions series focuses on specific instruments and ensembles housed in Heavyocity’s award-winning engine (powered by Kontakt). Master Sessions delivers an epic sound without the epic price! Complete with a wide range of tones and timbres -- from expressive cracks to rounded low-end thumps -- Master Sessions: Ensemble Woods places the vibrant character of percussive woods directly into the hands of the cinematic composer. With 11 unique multi-sampled wood ensemble kits and over 300 tempo-synced loops, Ensemble Woods delivers 2 GB of professional-quality percussive wood content. The 11 ensembles are teeming with percussive wood character, and are presented in both menu and single kit presets. Captured in simultaneous six-player ensembles, Ensemble Woods features an array of meticulously sampled traditional and non-traditional wood objects and instruments. From cajons to bamboo rods to struck acoustic guitars, Ensemble Woods’ unique percussive punch will add an expressive new layer to your next score. Mix and shape your sound using Heavyocity’s proprietary interface, containing global effects (reverb, delay, distortion, and chorus mod), per-wood EQ, per-channel ADSR, TriggerFX, and the signature Punish and Twist knobs. Master Sessions Ensemble Woods has loops that contain over 300 tempo-synced phrases arranged in menu and single loop presets. As an exciting new feature, the content is now divided into straight and triplet loops. Rearrange and adjust the loops by slice with Heavyocity’s signature “Loop Mutator”. Dial in the Trigger FX, master effects, filter modulation and ADSR for radical sonic results. Layer massive kits with hybrid loops to create huge walls of percussion. Mix and match loop “stems” to build your own unique combinations of tempo-synced rhythms. Master Sessions: Ensemble Woods’ user interface was designed FOR composers and sound designers BY composers and sound designers, providing simple, intuitive ways to alter the sounds without leaving the interface. Three levels of effects are intrinsically bound to the Kit and Loop components — apply effects globally, engage the Trigger-FX, or tweak individual sounds. The Loop Mutator™ allows you to re-compose and re-imagine 375 loops with spectacular results. With Master Sessions Ensemble Woods, take full control over number of steps, time signature, step subdivision (straight, dotted, or triplet), individual step duration, Loop/Slice selection, and velocity. Use the randomize option to quickly generate intricate patterns and beats. Eight fully customizable and linkable patterns per preset allow you to create complex grooves and sequences (up to 128 steps) of full rhythmic loops (in the Menus). Activate the Loop Mutator with a Single Loop preset to quickly re-compose or change the timing of any loop. Use any of Ensemble Drums’ percussion loops as they are or turn on the Loop Mutator™ and create unique sequences that are completely your own. Ensemble Woods - Loops offers 375 carefully sculpted percussion loops arranged into 2 main categories: Loop Menus and Single Loops. These loops, comprised of both straight and triplet grooves, are perfect for composing in any rhythmic environment. The Loop Menus are intelligently mapped and formatted into “breakout” presets, allowing you to perform the full loop in a single key or mix and match individual layers. Single Loop presets provide level, pan, and tuning for each slice, and allow you to quickly recompose your groove via midi drag-and-drop. Ensemble Woods was recorded at Bunker Studios in Brooklyn, NY by John Davis (not of Korn). The 3,000 square foot recording studio utilizes a wide array of analog gear, including an SSL 4040e mixing console, BAE microphone Pre’s, and a massive collection of vintage and modern microphones. The pinewood room of Studio A, boasting a huge 25’ ceiling, was the ideal environment for achieving the tight, punchy impact we desired for the Ensemble Woods Collection. The Heavyocity team performed all the percussion found in Ensemble Woods collection. Each ensemble consists of round-robin performances at multiple velocities. Close, room and ceiling-mounted X-Y mics created the perfect capturing environment for the massive ensembles.